Why would anyone pay if they do not have to? How can FairPay boost sales volume, revenue and profit? But why would anyone pay more than just enough? What other factors might push buyers to pay especially well? Is this a guessing game, or would there be suggested prices to guide buyers and increase seller control? Won't buyers just psych out the system and drive a race to the bottom? Won't cutting off those who pay too little anger many customers? Does FairPay work across vendors, and does it apply to one-time sales? Would FairPay be used as a special offer or go on indefinitely? Will FairPay coexist with conventional pricing? Can't buyers game the FairPay reputation system by buying under different false IDs? Is this too much to expect buyers to understand? Isn't having to think about setting prices going to be burdensome? What kinds of businesses would this work for, in what forms? Can you be more specific about how FairPay might work in a specific context? How hard is it to implement a FairPay pricing system? How do I start? What is the status of FairPay as a business offering? Have there been field trials or behavioral economics studies to support this idea? The answer is simple: Buyers who do not pay will not get further offers. FairPay will generally be most useful in cases where there is an ongoing relationship between the buyer and one or more sellers. This might be for ongoing purchases of multiple items or services, or for ongoing subscription access, taking the form of a series of limited FairPay offers from the seller in response to a series of FairPay pricing actions by the buyer. Sellers can be expected to limit the initial FairPay offers that they extend to new customers who lack established FairPay reputations. They might offer only items and quantities that might typically be free (much as with freemium pricing), so that their risk is small. Only after the buyer establishes a history of paying fairly will the seller continue to make FairPay offers for larger quantities or premium items. The benefits to the buyer of not paying will be limited and short-lived. The benefits of paying will continue and grow. Sellers can be expected to make these consequences clear when they first extend an offer to sell on a FairPay basis. This framing of the offer may be one of the most important opportunities to set the stage for good behavior. The product/service is not offered as "free," nor as simple PWYW, but as Fair PWYW, or perhaps better put as Pay What You Think Fair -- essentially on trial, on approval, and on evaluation. Perhaps the theme might be that buyers should "pay nicely" -- and sellers will play nicely in return. Sellers would make it clear that zero is "acceptable" -- with regard to reputation and future consequences -- only when that is arguably fair. Such cases of reasonable fairness in setting a zero price might include cases in which the buyer gives a reason why there is little or no realized value to the buyer (much as is often required for returns), or where only very low quantities are sampled (which might be conventionally understood as a buyer-directed form of free sampling). Of course a poor reputation need not be irredeemable. Just as recency factors into credit ratings, FairPay reputations would likely consider recency, as well. Even someone who behaved badly some time ago might be given another chance some time later. Care can be taken to assure buyers that they will not be "blackballed" unfairly, without an opportunity to explain or show good faith. How can FairPay boost sales volume and revenue and profit? A graphic view of how this self-selecting price discrimination feature of FairPay might dramatically expand revenue capture is given in The FairPay Zone blog post "The Long Tail of Prices -- Uncoil it with FairPay" The green area shows the revenue under standard pricing. The red and amber areas show potential revenue that is lost under standard pricing, but can be realized with FairPay. The details of how to get good pricing levels will vary for any given seller and product, but in general, buyer behavior can be pushed to increasingly desirable levels by sellers that manage their customer relationship well. Some of this is basic mechanics, and some gets to broader issues. One basic factor is that much pricing of digital content is done on a flat-rate, "all-you-can-eat" basis because consumers seem to prefer that to a ticking usage meter, even if that is economically inefficient on both sides. FairPay allows buyers to not feel enslaved by usage meters, but to view usage reports as guidance in setting their prices. Thus buyers who are heavy users, and/or who use lots of premium items or services, will recognize that they should pay at relatively high rates -- possibly more than they would under conventional flat-rate pricing. More generally, being eligible for future FairPay offers can be positioned as not a simple yes or no decision, but one with many levels. Buyers might be told that those who pay better than average will get enhanced offers, those who pay below average will get bare-bones FairPay offers. This might relate to larger amounts of product being made available before a price must be set, access to more premium item types, or other perks. In this respect, FairPay can behave much like freemium. This might be similar to the perks in frequent flyer programs that provide upgrades, visible recognition and status, and other special privileges. Such methods might even include making some aspects of good payment behavior visible as a status symbol (possibly only for those buyers who seek that kind of "conspicuous FairPayment"). Such perks might be pre-designated, but some hints of surprise bonuses. Such expectations of surprise effects might entice buyers and make it less desirable to try to "psych out" the process to minimize payments. Also, a good FairPay reputation might depend not only on how well you pay, but on how well you explain why you pay especially well or poorly in specific cases. This would give the seller valuable feedback not just on pricing, but on the merits of their product. Buyers might be given visible recognition for such thoughtful feedback (such as badges) naming them as elite partners, a form of status reward (like top ranked reviewers on Amazon) that consumers might seek to earn and display (with little fear of being seen as crass). Such methods might be useful not only to move average payers to pay more, but to convert bargain-hunters to be less fixated on price and more on relationship and value. FairPay also gets to fundamental questions of how businesses relate to their customers, and whether they can change the "conversation" from a zero-sum game of which party can get the most from the other and give the least, to a win-win game, where both parties seek a mutually beneficial value exchange. Society seems to be broadly seeking a more win-win kind of market, and that is just what FairPay is all about. Recent behavioral economics findings and experiments with PWYW pricing have added weight to these ideas. As noted for the previous question, sellers might find various ways to directly incentivize good payments with perks and better deals, but there are many other factors that can add to this as well. Related to the ideas in The Cluetrain Manifesto of markets as "conversations," Dan Pink's book "Drive" summarizes how current trends are pushing toward more win-win behaviors, building on three motivations: autonomy, mastery, and purpose. FairPay helps change marketplace dialog to exploit exactly those motivations, by giving buyers much more autonomy, opportunities to develop mastery, and ability to reflect their purpose into their pricing decisions. Sellers who position themselves as partners in value exchange, frame their FairPay offers thoughtfully, and work with their customers as partners seeking mutual benefit, will succeed in getting them to pay fairly. Those who do not may find it difficult. 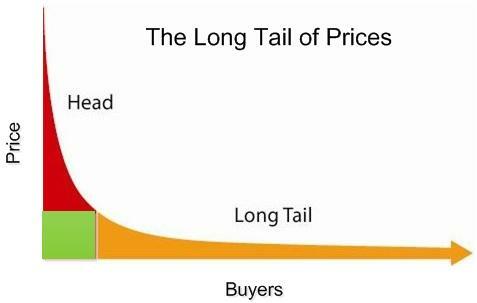 A related aspect of this is how well the seller can position the price paid as being a well-deserved compensation for value creation, and necessary to ensure a continuing supply of value. This obviously factors into the modest success of musicians and game developers with conventional PWYW sales (as for the Radiohead album sale -- why did so many pay more than one cent, and some more than the usual standard price?). Such positioning is relatively easy for sellers who can claim that most of the price goes to compensation to artists, journalists, or other human contributors. It is also likely to benefit companies that, like Apple, are perceived as being focused on consumer value, or who are recognized for superior service, or for other kinds of social benefit, such as green/sustainable, charitable, etc. Favorable positioning may be more of a challenge for companies that are perceived negatively, or simply as commodity suppliers, especially if not compensated by superior service or other positives. There are a wide variety of pricing cues that can be provided, and this is an area in which experimentation and ingenuity may be useful to find the best ways to set mutual expectations. Obviously complex behavioral issues are involved here. But in general, FairPay is a dialog that will probably work best with a high degree of openness about decisions and expectations. Suggested prices may be very desirable, and conventional set prices may also be a good reference point. Depending on context, suggested prices might be lower than set prices but in some situations they might be higher. For example a newspaper might have unlimited subscriptions for $5/month on a conventional basis, and might suggest that light users pay somewhat less than that and the heavy users pay somewhat more, and that those that value their unique journalism add a premium contribution. Similarly those that use only basic features might be suggested to pay less, those that use many premium features to pay more. Of course there could also be minimum prices as well, in a more limited form of FairPay. While this might be desirable in some contexts (such as where marginal costs are high or free-riding is a big concern), doing that would reduce the appeal of FairPay as a way to give buyers a feeling of freedom and partnership, and confidence that they will not suffer buyer's remorse. Sellers might also provide reference data on how other buyers have set their prices. These might be averages, or richer views of the distribution of payments (such as 25, 50, and 75 percentiles). Any of these kinds of reference prices might be set to correspond to the usage and market segments that the buyer belongs to, such as reflecting levels of light or heavy usage, basic or advanced/premium services, and demographic/psychographic segments, including affluence or student/professional status, etc. By framing offers and guiding pricing decisions appropriately, sellers might gain the effect of segmentations that are far more flexible and adaptive than conventional set-price segmentation schemes. A particularly attractive method is described in a blog post on how suggested prices might be combined with pricing set in terms of a differential above or below the suggested price to seek relatively high control and predictability over buyer-set prices. Such methods facilitate framing dialog on pricing fairness in terms consistent with the seller's perspective. Won't the pricing cutoff criteria get out on the Internet? Won't those who find out others paid less be unhappy? The flexibility and nuance of how FairPay is applied on an individual, dynamic basis can minimize such concerns. There may well be a segment of bargain hunters who will work hard to find the lowest prices a seller will tolerate. But, depending on the market, that segment might be only 10-50% of the total market. With FairPay, a seller can serve the highly price-conscious market, and generate some profit from them, and, at the same time, incentivize those who are more value-conscious to share a larger portion of their economic "surplus." Furthermore, those who pay well are less likely to feel suckered, because the offer management and price request process will frame the pricing decision in terms of the particular aspects of their usage, and of the level of premium services or perks they receive. Unlike conventional dynamic prices (like airlines) that are unilaterally set by the seller, the FairPay price is set by the buyer, so it inherently cannot not be deemed unfair by the buyer -- the argument for price differentiation becomes a shared/negotiated argument. The heart of achieving this is to tailor the offer, and to communicate its framing, such that the user understands the factors affecting a fair dynamic/individualized price (for both buyer and seller), and can make judgments in that context (understanding that other buyers may deserve different prices given different circumstances). The seller's rules can evolve over time and learning, and the seller can tailor the offer to the buyer. (The rules can be further nuanced, such as with the fuzzy logic, neural nets, etc. as used in credit management and fraud alerting). One example is for newspaper subscriptions or e-books. Here usage becomes one key dynamic factor -- if I never finish a book, I might reasonably pay little. If I refer to it regularly I should pay more. If I read 200 news articles/month I should be willing to pay more than one who reads 40. Again, more for business/finance, less for general interest. More for affluent, etc. A more advanced example might apply to considerations such as in airline pricing. I might be OK with paying more for last minute seats held for a premium price for last minute travel, but less for excess seats that would go empty. I might pay more if business, less if retired/student. More for no-bump, less for bump at will. Price discrimination is not objectionable if the buyer gets to agree to the rationale for it (with a conventional set-price option as fallback if the two sides diverge). Rarely, if managed with care. There can be warnings, probations (with continuation of only more limited value offers), etc., to nudge those honestly seeking to play nicely, before sending them back to the set-price fallback. 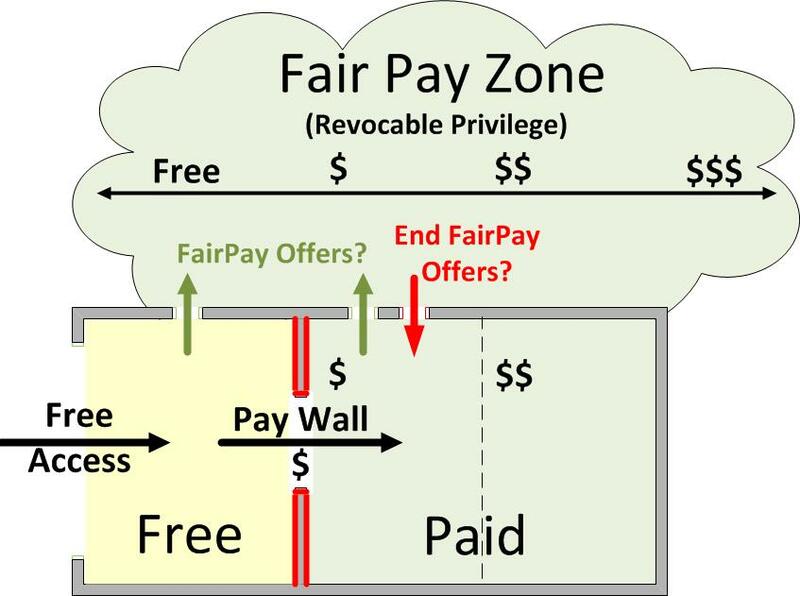 By framing FairPay as a privilege, possibly as a membership program or club, the contingency and responsibilities of the privilege can be made as clear as the benefits. Another factor that can strengthen the effectiveness of FairPay, as it develops, would be the emergence of shared FairPay infrastructures among multiple vendors to enable cross-vendor collection and sharing of reputation data. This infrastructure might behave much like cross-vendor credit reporting and rating services. Just as with credit reports, consumers will be more inclined to behave well to avoid harming a FairPay pricing reputation that many vendors will rely on. Such cross-vendor uses of FairPay would also extend its applicability, in that vendors might make offers in situations likely to be one-time sales, and still get significant benefits from FairPay. By using shared reputations derived from previous transactions with other sellers, vendors can decide whether to extend the offer to a customer who is new to them. At the same time, knowing that reports of their pricing experience would go to other vendors would provide strong incentive for the buyer to pay fairly, even with no expectation of further purchases from that one vendor. In a single-vendor context, FairPay can be expected to be most effective where there is an ongoing relationship, such as for repeat purchases, or subscriptions. Sellers will presumably want to apply Fairpay primarily in contexts where such an ongoing relationship is likely (either with them, or through a multi-vendor FairPay network). In general, ongoing use would seem desirable. As long as buyers pay fairly, both parties should be happy. The buyer maintains maximum freedom and flexibility, and the seller has a happy customer who pays fairly -- and many more who do the same -- thus hopefully maximizing revenue and profit. Of course the process can end, whether across the board, or for individual buyers. Overall, a seller may decide that, in his market, this method is just not the best -- and might switch to a more conventional process, or might limit its use in various ways. With respect to specific buyers, either side might decide they prefer conventional pricing as producing better deals -- or as good enough and simpler. Sellers may find it desirable to use FairPay only for introductory and light use, or for sampling, and they might require that regular, heavy users pay conventionally. Finding out how FairPay works relative to conventional alternatives in specific businesses, for specific customer segments, will be a learning process. Sometimes FairPay will not turn out to be best, and sometimes buyers and/or sellers will have difficulty getting it right. Complex behavioral issues are involved, and will vary in different contexts. Results will also vary depending on how well offers are framed and how well relationships are managed. Sellers who do not manage that part well may find conventional pricing simpler and more suited to their business. FairPay may often coexist with conventional pricing options, as an optional variation (or as a fallback). Some buyers may just prefer the simplicity of a set price. Many sellers will find it best to have set-priced options as an alternative (and/or a penalty) for those who do not play nicely under FairPay, or who are reluctant to try it. By positioning FairPay as a more flexible, buyer-controlled alternative to conventional pricing, sellers can entice buyers to put in the modest effort needed to consider this new idea. limiting the value-at-risk outstanding at a given time for any buyer who lacks a well-established positive reputation. Credit cards are widely used to verify identity (including name and address), without making any charge, and this adds only a modest hurdle to buyers. To manage identity risk, a seller might typically limit users who have yet to establish good FairPay reputations to low value offers. These might be for small numbers of items, and only for low value item types, and then, as good experience is gained, gradually extended to offer more FairPay "credit" covering larger quantities and more premium item types, as noted just above. Other fraud protection methods used in e-commerce can also be applied. That is a concern, but one that we suggest can be managed, and once past an initial learning curve, buyers will find it to be liberating and natural. Of course it will be important to educate buyers and sellers in how FairPay transactions can work and why they are desirable. FairPay turns many traditional ideas about pricing upside down, and shifts considerable responsibility to the buyer. Sellers will need to provide buyers with clear explanation of the basic process, and how and why their pricing should be fair. A Sample FairPay Offer is provided (for the example of a newspaper subscription) to suggest how this might be done. Sellers will need to carefully frame their specific FairPay offers to set expectations on value and responsibilities, to define relevant usage metrics, and to facilitate buyer pricing decisions. It will be important to do this well, and to keep early implementations as simple as possible -- but there is no reason why it can't be made reasonably simple, in many useful contexts. Also, it seems likely that most uses of FairPay will be as complements to conventional pricing options. So to the extent there is a learning barrier for FairPay, in such cases it will simply push customers to the conventional set-price option, rather than turn them away. By positioning FairPay as a more flexible alternative to the standard price offer, many buyers may be motivated to take the trouble to understand how to exploit that more attractive option. Once buyers and sellers experience the flexibility and nuance that can be realized with FairPay dialog processes, they will come to see how it can actually be more intuitive and sensible than conventional methods. FairPay can liberate both buyers and sellers from the rigidity of conventional pricing, and enable a new level of fluency in pricing. That is a critical design issue for sellers -- to be successful, a FairPay system must be designed to be very painless for buyers to use. What this means is that payment decisions for very small purchases need to be aggregated.� FairPay will generally not work well if buyers must think about pricing a single Web page or song or video clip.� But it can work well for a subscription or other bulk purchase (such as a bundle of songs or videos or e-books or apps). This is how most people pay now for mobile phones and cable TV � not per item, but per month, for some large basket of items. FairPay subscriptions might be paid monthly, and once consumers have established good FairPay reputations, price setting might be done only annually. Similarly, buyers could be offered bundles of items, with further bundles to be made available after the prices are set and judged acceptable for the previous bundle. services that now charge a high rate, and seek to broaden their market with a more limited FairPay option for low-end market segments. FairPay it is also applicable to physical products and services, as well, especially for those with low marginal cost (such as CDs/DVDs), or with low cost tie-ins (such as product service and support, and other product related services).� PWYW has been found (references) to be effective for some kinds physical products (especially as a way to attract new customers), so FairPay should perform even better. A working paper on FairPay Application/Market Segments summarizes how various specific business segments might apply FairPay processes. FairPay pricing processes can be applied by individual providers of products/services, or more broadly as cross-vendor networks of FairPay sellers that pool FairPay reputation data much as credit reporting is done across vendors. FairPay infrastructures can be developed by individual seller businesses, or by platform providers to such businesses. Sure. Please see the working paper on FairPay Application/Market Segments (mentioned for the previous question) for links to blog posts that explore specific business use cases, and check the FairPay Zone Blog for recent additions. Some brief examples are also given in the introductory article on FairPay. Depending on the business context and the level of sophistication desired, implementation effort can range from very simple to reasonably complex. In many contexts, useful FairPay implementations can be done by an individual seller company without great effort. As a very beneficial partial step toward FairPay, one option is to introduce FairPay in just a survey mode, in which transactions are done conventionally but buyers can indicate if they feel they should pay more or less, and give their reasons. Such a survey mode can generate valuable data on customers, and begin a mode of dialog that can set the stage for full use of FairPay. This lets a seller get his toes wet by starting a structured dialog with buyers about what they want and how they value it, without need to integrate with live pricing systems or put any revenue at risk. Cross-vendor FairPay platform services can build the infrastructure for managing offers, tracking pricing actions, and maintaining reputation databases, and make that available to even low-end sellers to exploit with simple Web services. Such cross-vendor services can also pool FairPay reputation data, so that even small sellers might have access to high value reputation data on large numbers of buyers, even for one-time sales. If you are interested in starting to use FairPay pricing processes, please contact us. Current information is now in the Overview. Behavioral economic research on PWYW and related pricing issues, and studies and reports on field trials of PWYW in various forms are very supportive of the value of FairPay as described here. There have been numerous studies of PWYW in both real-world and theoretic contexts, and their findings indicate that such methods can be far more effective than many people might expect. Selected references are discussed in the Resource Guide to Pricing.